January was an interesting month for Queens real estate. In January we felt the effects of a new tax reform bill, loss of the SALT deduction, stock market fluctuation, appointment of a new Fed Chairman, and interest rate increases. Put simply, there was a lot that happened at the end of 2017and in the beginning of 2018 which would shape what we have experienced so far this year. All of these factors has led to an overall lack of activity to start the year. We have noticed that buyer activity has slowed, mostly with our higher priced homes, but even with some of our more affordable properties as well. We put up 6 new listings in January and what we noticed after we started marketing them was lower turnouts at our open houses, and less people reaching out to us to inquire on the listings. Keep in mind that we use the same approach in pricing and we are never out of the market so the shift is likely a result of a shift in buyer demand rather than an issue with pricing. What we’ve heard buyers mentioning moreso than anything are the rate increases as well as complaints about prices being too high. The latter is something we’ve been hearing for the past few years so that is not something new this year. Another note, something we saw more of in January was the amount of people inquiring about their home’s value, advice on when the best time to sell is, and what they could do to maximize their profit. We definitely had a lot more people reach out to us this January vs last January. 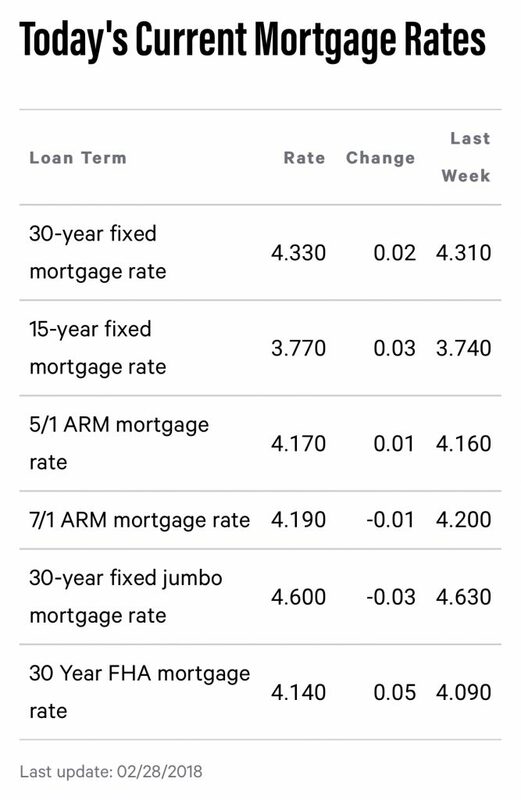 Some sellers have asked about the new tax reform and interest rate increases with concerns of how it will affect their homes value. The answer is not very clear, however, we definitely feel that something is happening which is causing some consumer anxiety. This can be due to a combination of rising interest rates, new tax reform, stock market volatility, rising prices, etc. It will be interesting to see what happens as the warmer months approach. The Long Island Board of Realtors reported Queens home sales at a rate of approximately 652 homes during the month of January. This was a decrease of 9.1 percent from December and a decrease of 8.3 percent from January of last year. Specifically, our Queens real estate market report February 2018 shows that Residential home sales were UP 2.8%, Queens Condo sales were DOWN 40%, and Queens Coop sales were DOWN 15.7% compared to the same month last year. Over the last 12 months, Queens home sales are DOWN .4%. The median home price in Queens dropped to $544,500 in January, this is a decrease of 1 percent from December, and an increase of 112.3 percent compared to January of last year. The median home price has increased by approximately $59,500 since last year. Specifically, our Queens real estate market report February 2018 shows that Queens residential home prices are UP 3.6%, Queens Condo prices are UP 7.8%, and Queens Coop prices are UP 10.2% compared to January of last year. Over the last 12 months, the median home price in Queens is up 12.9%. 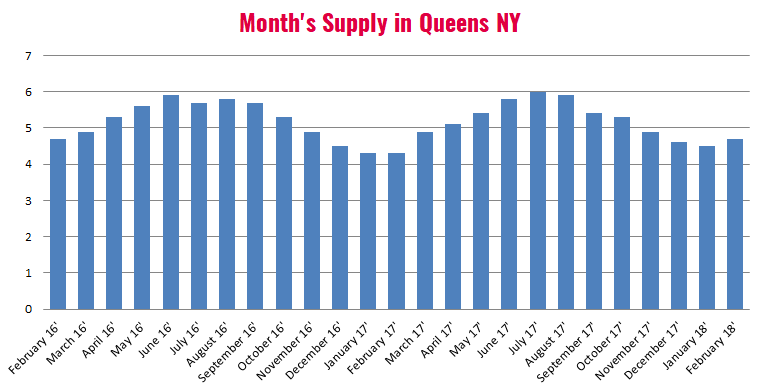 There is currently a 4.7-month supply of housing inventory in Queens, this is up from the 4.5-month supply we had last month, and up from the 4.3 month supply we had in February 2017. The number of homes currently for sale in Queens NY is 3,531. This is an increase of 3.7 percent compared to last month, and an increase of 9.8% compared to February of last year when there were 3,217 homes for sale in Queens. Specifically, our Queens real estate market report February 2018 shows that there are currently 2,296 residential homes for sale, 404 Condos for sale, and 831 Coops for sale across Queens county.